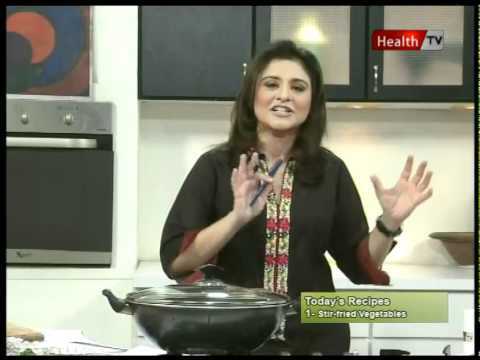 Healthy Cooking – “STIR FRIED VEGETABLES” Part-1 (21 Nov 2011) Health TV. It’s a live program with Amna Khan focusing on cooking/baking dishes that are healthy, high in nutritional value, complimenting an active lifestyle. Amna keeps the viewers engaged with live calls and health tips about the various ingredients used in a particular dish. You can also call her to ask for any type of recipes for healthy and delicious foods. Amna Khan also share her views about healthy foods, healthy eating, healthy lifestyle, healthy recipes, diet food, healthy meal, best dishes of all times, most favorite dishes in Pakistan, Chinese food, Italian food, healthy Pakistani foods, healthy Indian foods, best healthy recipes, fast food, health & fitness, food channel, food infotainment and enjoy the healthy food with your family.